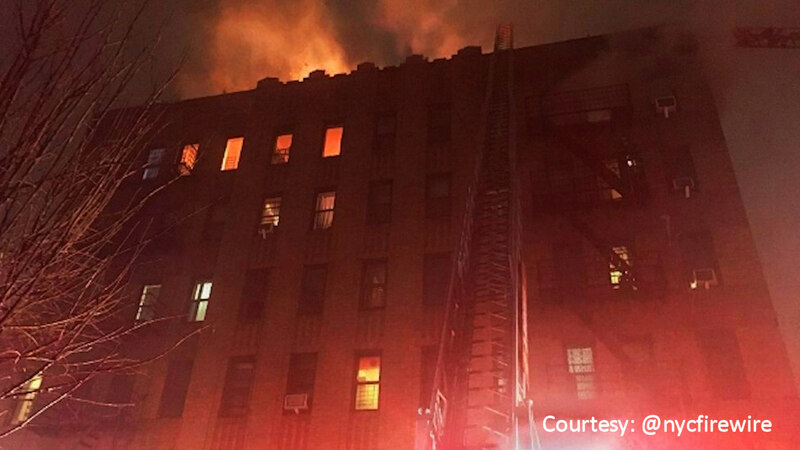 PROSPECT LEFFERTS GARDENS, Brooklyn (WABC) -- Dozens of residents were evacuated from burning apartment building in Brooklyn on Tuesday night. The fire stated between the roof and the ceiling of the six-story building on Winthrop Avenue in Prospect Lefferts Gardens around 8 p.m. The three-alarm fire then spread to the front of the building. Firefighters had to cut holes into the roof of the building to extinguish the fire. Fortunately, no one was injured, but some 100 residents were evacuated from the building. It's not yet known when they can return to their apartments. The Red Cross is on the scene assisting displaced residents.